What a pleasure it was to see a new independent shop opening in Llandudno's Upper Mostyn Street. 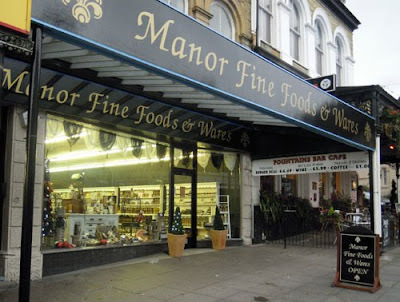 Manor Fine Foods & Wares has opened in the old Motorworld premises and have taken the time and trouble to fit out their shop in a very professional manner. It's also great to see someone aiming for the higher end of the market, rather than just the bargain basement 'pound market'. Llandudno's Mostyn Street used to be renowned for the high quality of its independent shops, let's hope that this is the first step towards re-establishing that reputation. I wish them the best of luck. What sort of fine foods? Went in today to black my nose and place was mainly full of jams, preserves and that sort of stuff. A conversation with the assistant revealed that they will also be having freezer and fridge cabinets with other goodies. The accent seems to be on more expensive, quality and unusual items not available in your local supermarket. Just called in at Manor fine foods having seen the article in the local paper to sample some of the local produce.Since when has Dorset been local to Llandudno ??? ?While I agree Upper Mostyn Street does need some "high end" shops why open a fine food shop opposite the best deli in Llandudno ?While I wish them well I'll stick to the proper home made,locally produced fine foods over the road. The deli across the road is for sale and has been for a while. I wonder where I can buy a "grib"? For sale,is it really,and your point is ???? ?Does the deli being for sale detract from the quality or origin of the food the serve,I think not.Lets be honest the deli serve very good food,True Taste of Wales judges can't be wrong,they saw their food fit to award a gold at a ceremony last week,for sale or not. As for me "getting a grib"why would I need a mathematically concise data format ??? Me thinks someone needs a spellcheck ! Upper Mostyn Street "USED to be renowned for the high quality of its independent shops" The provision of Manor Fine Foods to the street is hardly the start of a ressurection of independent trading! Merry Moon, Escape, Grumpys, Kava, Little Deli, Chess, Silver Gem, Listers - to name but a few, are very much privately owned independent shops. During a shopping expo at the top of town last week (with some relatives who were visiting from Cornwall) it was commented on that the newly opened Manor Fine Food shop had literally "nicked" its ideas from every other single shop in the street and just "merged" it into one shop. Im local and really do appreciate the diverse shopping experience Upper Mostyn Street provides. I only wish that the tourist would investigate this end of town. "it was commented on that the newly opened Manor Fine Food shop had literally "nicked" its ideas from every other single shop in the street and just "merged" it into one shop." I'd call that smart business myself? Having said that, I've never seen the Manor shop really busy and I do wonder how it can survive the lean Winter months. I live in Llandudno and have been to Manor Fine Foods quite a few times since it opened, and can quite safely say it by far has the highest standard of produce I've seen in a long time! Llandudno has needed a place like this for a while, and makes a change from all the pound and cheap souvenier shops at the other end of town. I went in today and it was packed, which is nice to see a local independent business doing so well in todays climate. They also have an ice cream counter from which I had a rum and raisin and it was gorgeous! I think they said it was from somewhere on Anglesey they source it from. Who cares if not every single product is local, from what I've seen they're trying and it's about time we had more places like this.